HARTFORD – Six faith leaders, including Connecticut Conference Minister the Rev. Kent J. Siladi, were arrested Monday afternoon at the State Capital while assembling to speak out against the severe budget cuts proposed by Governor Dannel Malloy. They were charged with Interfering with the General Assembly. Five of the six were also charged with Disorderly Conduct. Both charges are misdemeanors. 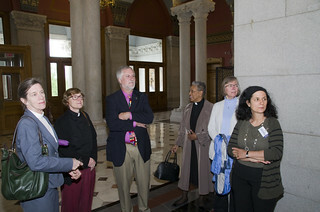 Moments after delivering a letter signed by 114 faith leaders calling for state legislators to consider more equitable alternatives to the current course of the state's budget, more than 30 members of faith organizations and the Moral Monday movement gathered in the rotunda of the State Capital to speak out against the austerity measures proposed by the Governor and members of the General Assembly. "We want a Moral Budget," said Bishop John Selders, pastor of Amistad, UCC, in Hartford and a leader of Moral Monday CT.
Siladi addressed the problem of the budget's limited perspective. "So we stand here in the people's capital to make a proclamation to our legislators, that we stand here to speak in and on behalf of the poorest among us: our children, those who live in poverty in one of the richest states in the land. We cannot ask for an austerity budget. We must look at the income side." Several minutes after the group gathered, Selders prompted the group to begin singing "This Little Light of Mine." Moments later, Capital Police approached and led Selders away as others continued to sing. Authorities motioned for individuals to leave and guided several to the doors. Those who refused were escorted away form the rotunda peacefully. As an officer directed Sialdi to leave, he shook his head and said "I'm not leaving." The officer proceeded to take Siladi into custody and lead him away from the group. Those who left the building gathered on the steps outside and continued to sing and call for a Moral Budget. In addition to Selders and Siladi, another UCC pastor, the Rev. Carlene Gerber, Senior Associate Minister at First Congregational Church of Old Lyme, and three other faith leaders were arrested: the Rev. Marie Alford-Harkey, Michael Reardon, and the Rev. Joshua Paweleke. Michele Mudrick, Legislative Advocate for the CT Conference, says that people can still make an impact on the budget decisions by contacting their state legislators and stating that they do not support a budget that cuts aid to children and the poor. She also asks clergy to write letters to the editors of their local news outlets stating the need for a moral budget that refrains from cuts to the poorest and neediest. For more details about alternatives to the budget, read the letter to the Governor signed by Siladi and other clergy.